One of the most reasonable ways to end the Israeli Palestine conflict is to declare the Holy Land as not holy, as just a regular place. It may sound unreasonable, but I think that for most of the Jewish people this had already happened. Many if not most Jews don’t see the “holy places” as holy in the traditional sense of the word. Many poets and writers had already said that there’s a lot of sacredness in the casual and regular events and places, in everything, so this idea is not even be a big change of mindset for most people. If religions would start to consider the whole wide world as holy, including all of its residents and natural treasures, I think it’ll be great for everyone. Maybe then humanity would be able to use the incredible power of organized religion for good causes. Today, February 25th, is the 20th anniversary of the cave of Patriarchs massacre in which an American born Jewish doctor killed 29 Palestinians while they were praying where Abraham, Jacob and Isaac are supposedly buried. The city of Hebron knew an even more terrible massacre in 1929, in which 67 Jews lost their lives and the rest escaped from the city. Many of the holy places in Israel-Palestine had some bloodshed in them. 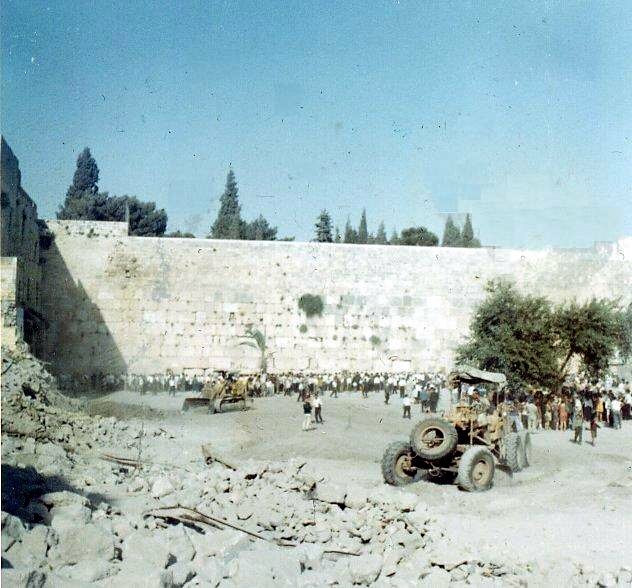 What we now recognize as the wailing wall plaza in Jerusalem used to be a the 800 years old Mughrabi Arab neighborhood that was demolished a few days after the 1967 war, in order to flatten the area for Jews to pray and gather there. Such actions, I believe, take away whatever holiness was in a place. I don’t have a specific way to make such idea (I call it de-hollizing but maybe there’s a better name for it) a reality, if such idea is even a good idea. Adam of Isabella Freedman Jewish Retreat Center had already showed a lot of excitement for managing a holy site in case the Jewish world would decide to de-hollinize Jerusalem and transfer its holy spirit to the beautiful retreat center in Connecticut (he was actually freaked out by the idea, I understand him). I imagine that a petition of many Rabbis declaring that they see holiness in every place and in each creature on earth and not only in few places or some graves might have a huge impact, but I’m neither a Rabbi nor an organizer. “De-hollinaizing”, like disarming, like dislike something that does very little to benefit a more peaceful future. Rabban Yokhanan Ben Zakai, which we named our son Zakai after, is famously recognized for transferring Judaism into an era of prayer and study from an era of sacrifying animals in the sake of worshiping God. His teaching during the distraction of the second temple that loving-kindness equal to sacrificing animals in its importance is one of my favorite quotes from the Jewish literature. Just saying. Anyway, regardless of all that, this is the peace pole project, in which tens of thousands of poles were placed in more than 180 countries around the world with the sentence “may peace prevail earth” ישרה שלום עלי אדמות written on them in many different languages. I love this inspiring project.